We’ve heard you and we here at SugarDoodle want to try something new for those Relief Society instructors requesting help. I’m a visual learner, and do well with a take home that reminds me of the concepts learned during instruction. And for me, even as an adult, this method of learning is still quite effective. It’s much of why I became a doodler by trade. This week, I’m excited to offer a handout that may help you simplify your lesson preparation, and stay clear from, as President Uchtdorf refers to as, a foolish sacrifice. Remember his talk found HERE and the example of spending many hours stitching the title of the lesson into homemade pot holders for each member of the class? Let us spend those hours for you, so you can spend time in the scriptures and other gospel study during your prep time. Teachings of the Presidents of the Church: Howard W. Hunter is our study manual this year. I started with an upcoming lesson for June found in Chapter 10, The Scriptures: The Most Profitable of All Study. I shared a post a few weeks back about prayer and hard work found HERE. The scriptures to me are right there at the top of the same list of habits to learn. Scriptures are pretty much the answer to 99% of the questions asked in our church meetings and it’s definitely one of the most basic ways we can stay happy in this life. I absolutely loved this lesson using quotes from President Howard W. Hunter. His ideas on scripture study are spot on. I created a little cheat sheet for your class to refer to during or after your lesson, you decide whether you give it to them before class starts or at the end of class. I created this first handout in black and white. It’s a one pager, easy to copy or print off with a minimal cost. You can color it or they can color it, doodle on it, make more notes, it’s up to them. You might find sisters using their scripture markers or pulling out the diaper bag crayons to doodle and take notes from their own conclusions on their personal cheat sheet. The printable can be found in the Sugardoodle Shop HERE. You might even want to share this resource with the priesthood instructors. The next thing you may find is they just might add a lace cloth to the table. Study on! This guest post was submitted by Aimee Ferre. She grew up in the desert of East Mesa in Arizona, but married a mountain loving Utah boy. She currently lives in Sandy, Utah and is a mom to 3 daughters. She owns a small crafting business where she creates holiday decor and specializes in hand-lettering. You can always find her creating new projects or planning gatherings for friends and family. 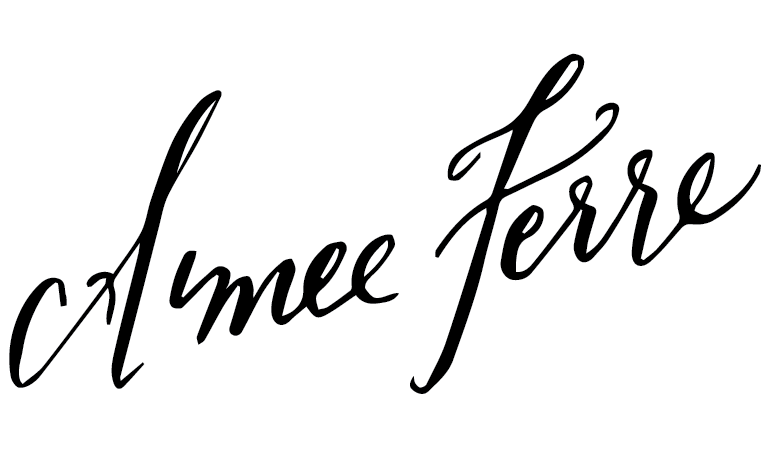 Follow her on Instagram to see what is currently on her desk or find her blog at www.aimeeferre.com. 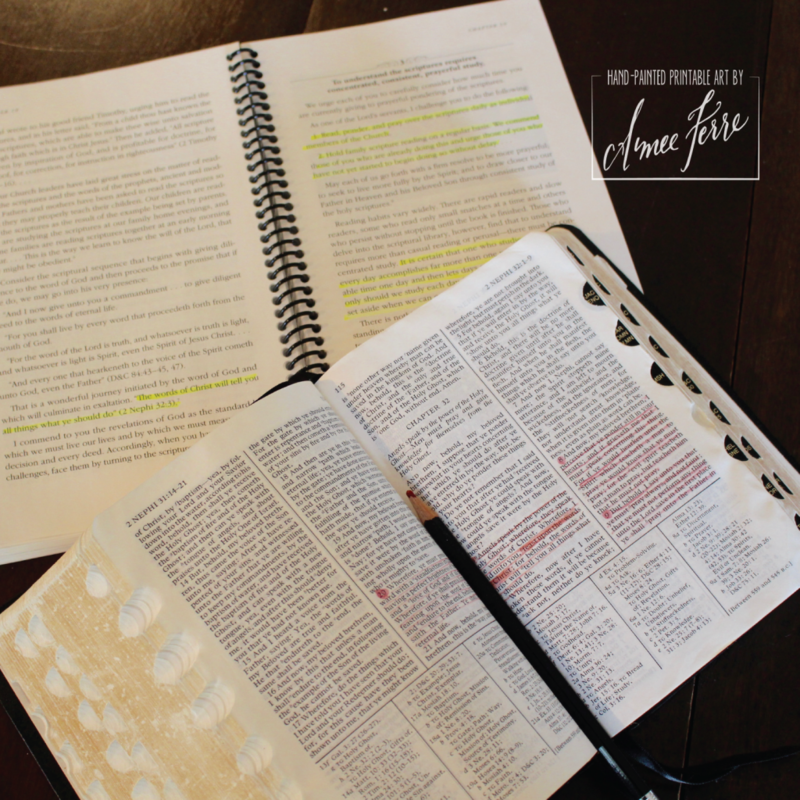 This entry was posted in Priesthood, Relief Society, Scriptures, Teaching Tips and tagged 2016, Aimee Ferre, Howard W Hunter, Relief Society Handouts, RS Teaching Helps, Scriptures, Teachings of Presidents of the Church on May 21, 2016 by aimeeferre. 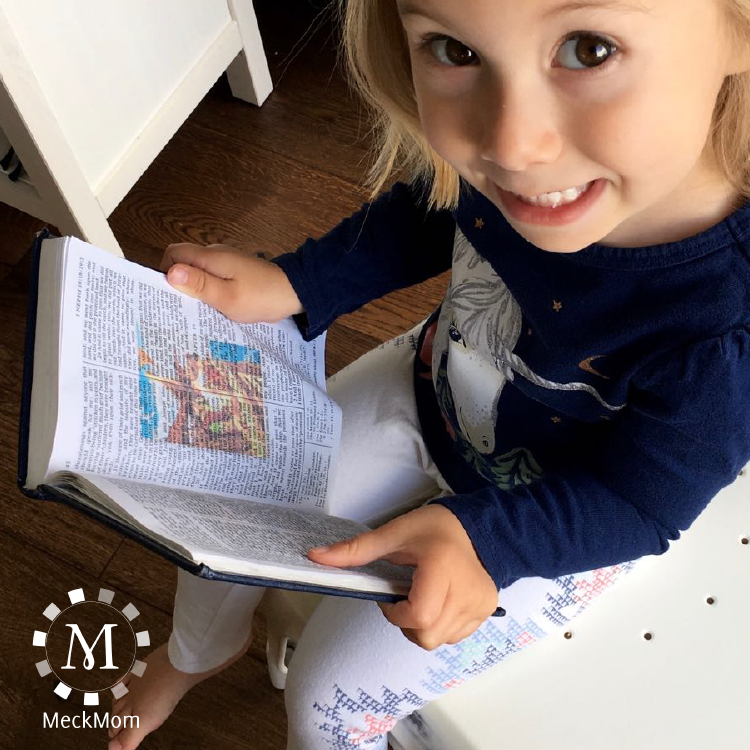 The scriptures are always the best tool to teach kids the gospel – but they can be intimidating for kids to use. When my kids were little I really wanted to help them connect with their scriptures (without spending a ton) so I created these cool, transparent scripture stickers based on the Gospel Art Kit found on LDS.org. Here’s a quick video explaining why I created them and how they’ve made a difference in my family’s scripture study. 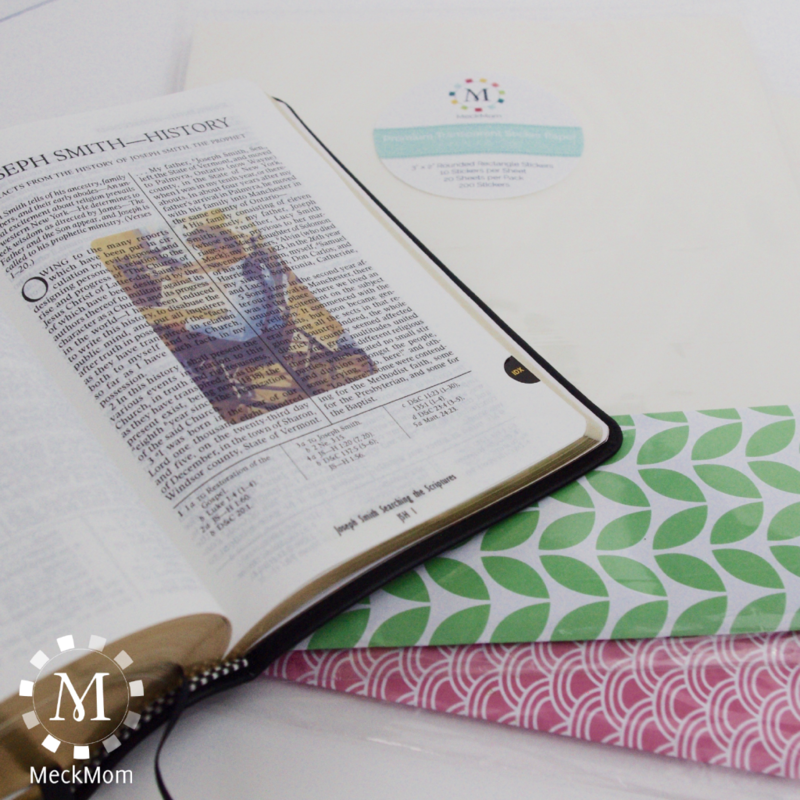 You can find all the free downloads and links to purchase my very favorite sticker paper in the scripture study section of my site, MeckMom.com. 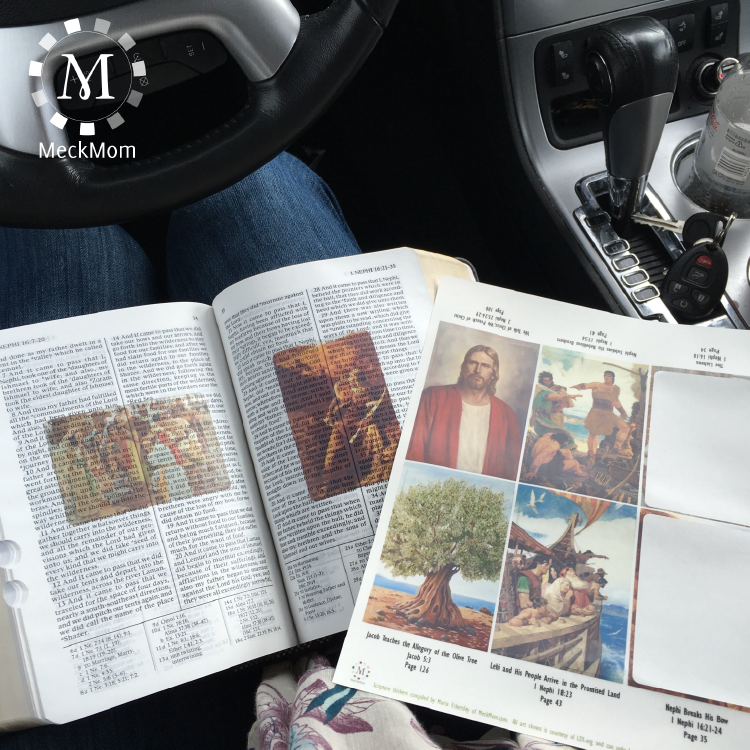 This entry was posted in Book of Mormon, FHE, Primary, Scriptures, Teaching Tips and tagged Family Scripture Study, gospel art kit, LDS, meckmom, Primary, Scripture Study, Teaching Tips, video tip on May 16, 2016 by Maria Eckersley. Planning a lesson can be an overwhelming task. There is so much content to choose from that it can be really difficult to know where to start…especially for young teachers. My latest teaching tip will help you focus your study and jot down notes for all the key areas of a great lesson. Check out the video below to see how it works. You can find the inexpensive printable lesson templates on the Sugardoodle Etsy shop. Click here to hop over and grab a copy for yourself. This entry was posted in Printables, Scriptures, Teaching Tips, Young Men Young Women Joint Activity and tagged Come Follow Me, LDS, meckmom, teaching tip, video tip, Young Men, Young Women on May 2, 2016 by Maria Eckersley. If you are following along we are on Day 6 of the Easter Advent celebrating Holy Week. I hope you are posting on our Facebook page HERE your experiences, we really would love to see them! Tag your photos on your personal Instagram and Facebook pages using the two hashtags #SDEaster #Hallelujah. Today’s devotional focuses on the atonement of Jesus Christ and His suffering for us because of His love for us. Display the “I Believe in Christ” 8X10 print where you are displaying the other visuals (or you can download a larger 11X14″ file HERE). I chose the Crimson Red Greek Eggs family activity for today to serve as a reminder of Gethsemane. There is a darling recipe printable for the Crimson Red Greek Easter Eggs showing palm leaves, red eggs and Easter lilies within the design. The entire kit is available HERE for download if you are just learning of this week of devotionals we have available. This guest post was submitted by Aimee Ferre. She grew up in the desert of East Mesa in Arizona, but married a mountain loving Utah boy. She currently lives in Sandy, Utah and is a mom to 3 daughters. She owns a small crafting business where she creates holiday decor and specializes in hand-lettering. You can always find her creating new projects or planning gatherings for friends and family. 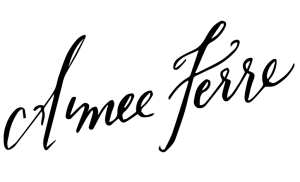 Follow her on Instagram to see what is currently on her desk or find her at aimeeferre.com. This entry was posted in #Hallelujah, Easter, Family, FHE, Love, Primary, Printables, Relief Society, Scriptures, Young Women, Youth and tagged Aimee Ferre, Atonement, Christ, Crimson Red Greek Eggs, easter, Gethsemane, halleluljah, Holy Week, Resurrection, Savior on March 23, 2016 by aimeeferre. Day 4 of the Easter Advent for Holy Week is a little more involved if you are interested in studying the Jewish Passover and it’s relation to The Last Supper. It’s quite interesting and I loved learning about the symbols and meaning behind the foods of the Seder plate. Consider sampling different foods of the Passover. There are many recipes online or you can just prepare them simple. Many butchers offer a shank bone during the Passover period on the calendar, but you can always call your local butcher and pre-order it if you are interested in this portion of the outline. 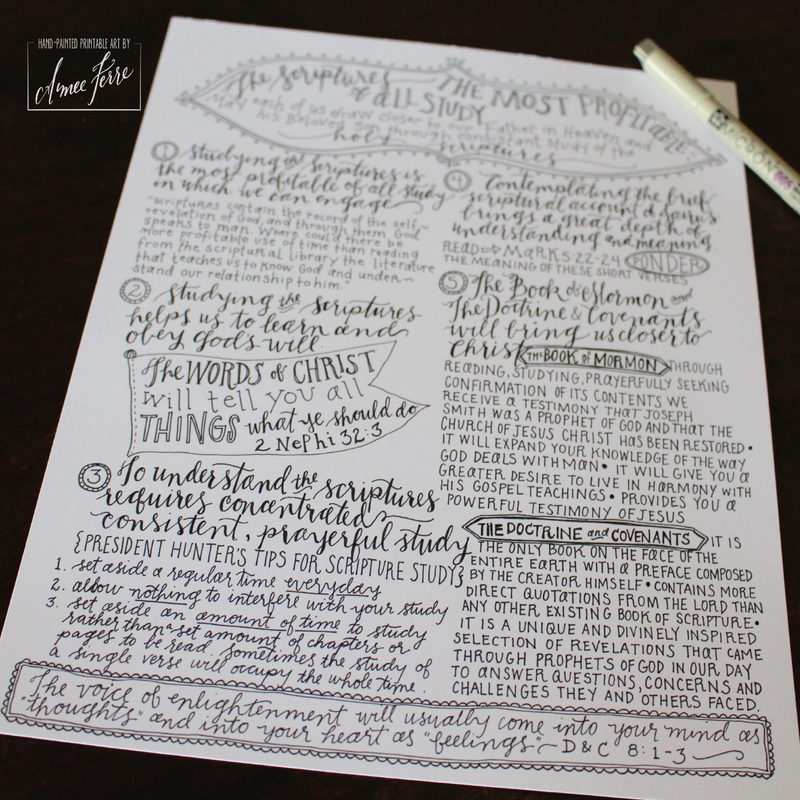 Make sure you have your 8X10 print of the Matthew 28:5-6 scripture printable. If you would like it in a larger size, it is also available in an 11X14″ separately HERE . This entry was posted in #Hallelujah, Easter, Family, FHE, Primary, Printables, Relief Society, Scriptures, Youth and tagged Advent, Aimee Ferre, Christ, easter, hallelujah, Holy Week, Redeemer, Resurrection, Sader Plate, Savior on March 21, 2016 by aimeeferre. I’m going to share two posts today, since tomorrow is Sunday. On Day #3 your family will discuss the Parables that Christ taught in the Bible. And if you choose to play the Parables Charades or form a clay oil lamp like what the Parable of the Ten Virgins used, have fun with it. I did it with my daughter’s junior high age friends one night as I was prepping for the photo shoot. Two of them really got into the project and spent an hour forming the most perfect lamp. You can imagine their huge disappointment when we realized it wasn’t a oven bake clay. So let that be a lesson to you. The other three just did what they could to get through the exercise. So again, tailor these experiences to your family. If you are just joining us, the kit is available HERE! And no, it’s not too late to start! This entry was posted in #Hallelujah, Easter, FHE, Printables, Relief Society, Scriptures, Young Women, Youth and tagged Advent, Aimee Ferre, ancient oil lamps, Christ, easter, hallelujah, Holy Week, Parables, Redeemer, Resurrection, Savior on March 19, 2016 by aimeeferre.